Martinique weather is blessed by annual average temperature of 80°F (26°C) do go along with the amazing grey and black sand beaches in the north and sparkling white sand beaches on the southern coast of this Caribbean island. Get the current weather forecast for Martinique below. Martinique is a tropical island located in the eastern archipelago of the Caribbean islands. The western side of this Caribbean island borders the Caribbean Sea (of course), and the eastern side of the island holds back the Atlantic Ocean. On both sides of the island, the average water temperature hovers around 80°F (27°C). Together with the Azores anticyclone, which results in a warm eastern trade wind known as the Alize (les alizes), the warm waters produce a comfortable average yearly temperature in Martinique of between 80°F (26°C). In fact, average low temperature during winter is usually no less than 71°F (21°C), while the average high temperature during the dry season rarely rises above 87°F (30°C). 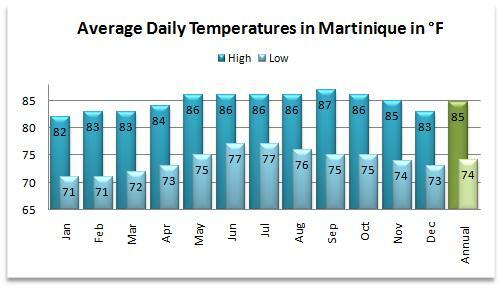 Only two seasons mark the climate of Martinique weather. The dry season, which is evident from December/January through May/June, is referred to as Lent, or the carème. During this time, the Azores anticyclone winds shift toward the south. This causes warmer, more pleasant weather and less frequent rains, and is the perfect time to visit the world famous Martinique Carnival. During April, the driest month of the year, Martinique sees rainfall occur only 13 days on average. One interesting note is that the trade winds are most powerful between December and February than during the remainder of the year. Those interested in adventure water sports such as kite-sailing and windsurfing may want to consider this when planning a vacation. In contrast, the rainy season, also known as "Wintering," occurs between July and October. In September, significant rainfall occurs nearly 26 days on average, making it the rainiest month. During "Wintering," intense and frequent rain showers may occur. "Wintering" also coincides with hurricane season. Martinique weather was last interrupted by a hurricane on August 17, 2007 when hurricane Dean passed between the Caribbean islands of St. Lucia and Martinique. On average, Martinique is brushed or hit by a hurricane or tropical storm ever 3 years or so, but only sees a direct hurricane strike about every 20 years. In fact, Martinique weather was only interrupted by a tropical weather system 45 times in the last 137 years. Another factor affecting the weather of Martinique is the humidity. The summer months can be hot and quite humid in low-lying areas of the island such as Fort-de-France. This discomfort can be offset somewhat by climbing into or visiting the more mountainous areas, where the trade winds aid in cooling the air. Even with the humidity of Martinique Weather at its highest, however, Martinique remains a lovely Caribbean island with a temperate climate and warm sunny weather.